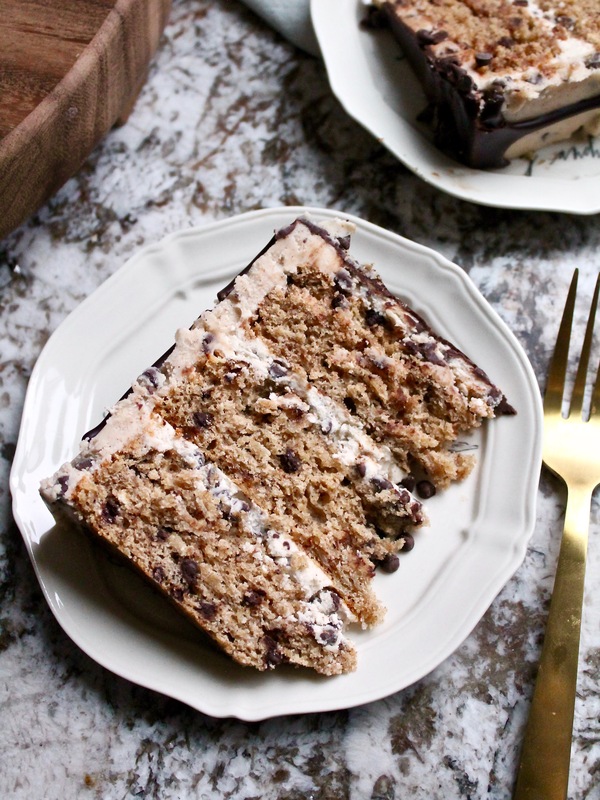 Inspired by the classic cookie, my new Oatmeal Chocolate Chip Cookie Cake is made up of tender and hearty oatmeal chocolate chip cake layers and filled with a cinnamon chocolate chip buttercream. I’m excited to share with you my first new cake of 2018! 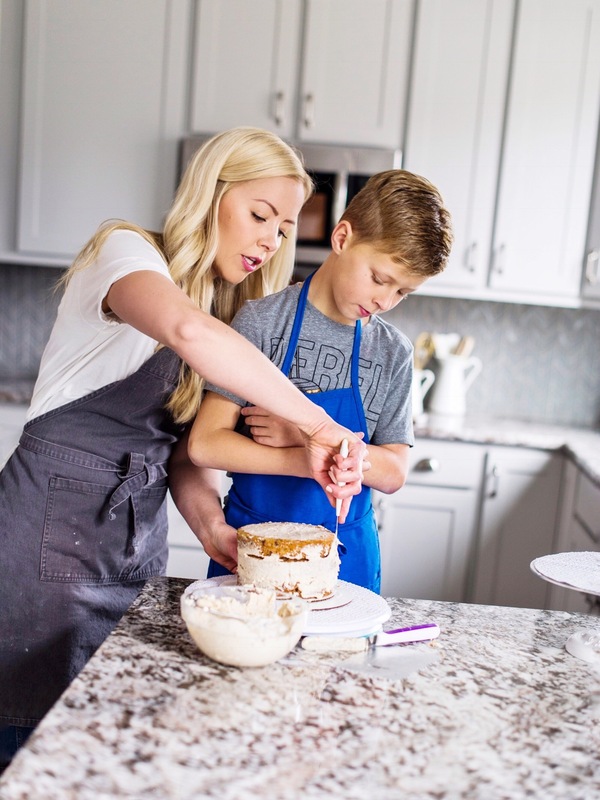 This Oatmeal Chocolate Chip Cookie Cake was inspired by the classic cookie we all know and love, but was also inspired by my son Westin. 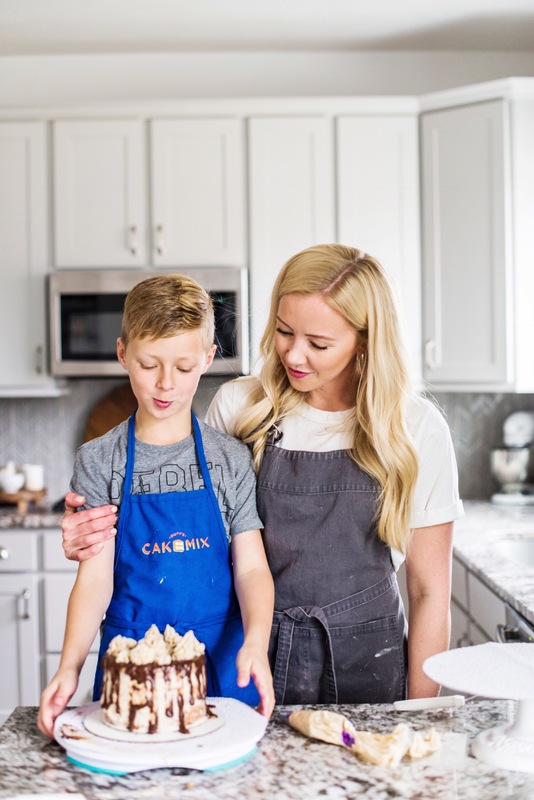 He’s an avid viewer of the Food Network show, “Kid’s Baking Championship.” We watch it together every Monday night. In the season opener, the kids were challenged to make a cookie cake. The kids picked all sorts of cookie flavors, but the one that stood out to me the most was oatmeal chocolate chip. 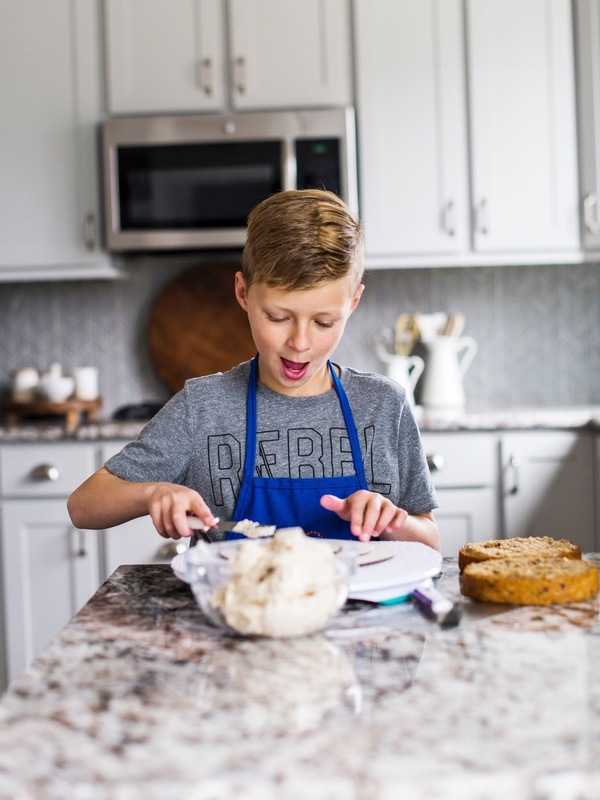 While the kids made actual cookies and stacked them like cakes, I sat there thinking, “this cookie flavor actually needs to be a cake, not just a cookie!”. The wheels in my headed started turning and I got to work the next day. I knew immediately what I wanted this cake to taste like. It had to be tender, but also hearty to mimic a real oatmeal cookie. I didn’t think throwing in uncooked oats to some cake batter would give me both of those qualities. I did some research and decided I could actually cook my oats and add them to the batter, which makes the cake nice and moist. As I thought about the rest of the cake, I thought back to my Pumpkin Spice Cake I did in the fall, using some of the Kodiak Cakes Pumpkin Pancake Mix. 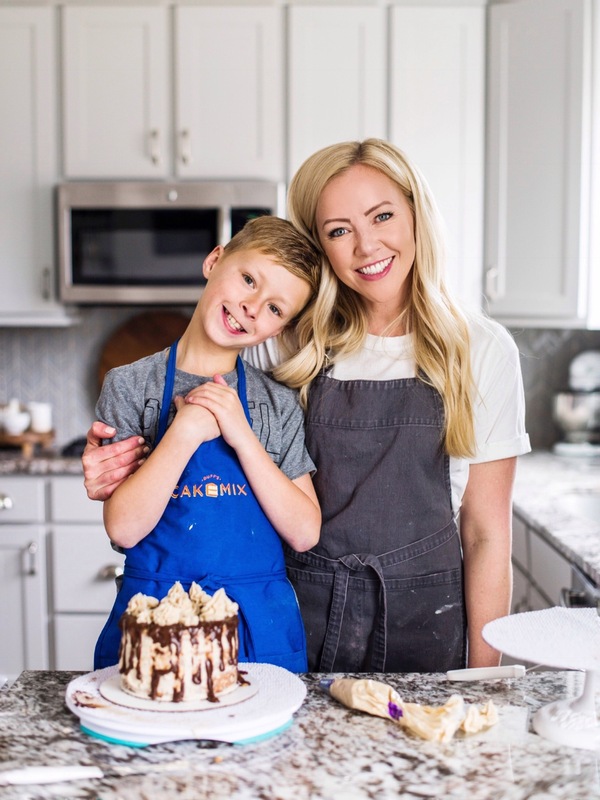 The flavor and texture were so perfect, and I wondered if using some of Kodiak’s Cinnamon Oat Pancake Mix would help give me the flavorful, hearty cake I was looking for. (No, this post isn’t sponsored by Kodiak, I was just so happy with how the Pumpkin Spice Cake turned out that I thought I’d try using some of their mix again). So, instead of using 3 cups of all-purpose flour, I used half all-purpose flour and half Kodiak’s Cinnamon Oat Mix. I love how the texture and flavor of the cake layers turned out – just as tender and hearty as I had hoped for. I also made the cakes using all flour instead of flour and Kodiak mix, and it turned out great too. If you use only flour, I’d add an extra teaspoon of cinnamon and a 1/4 cup uncooked oats to the batter at the end. I like that the Kodiak mix gave the cake some extra cinnamon flavor and a few pieces of uncooked oats to create some texture. For the frosting, I used my cinnamon buttercream from my Churro Cake and added some mini chocolate chips to it. 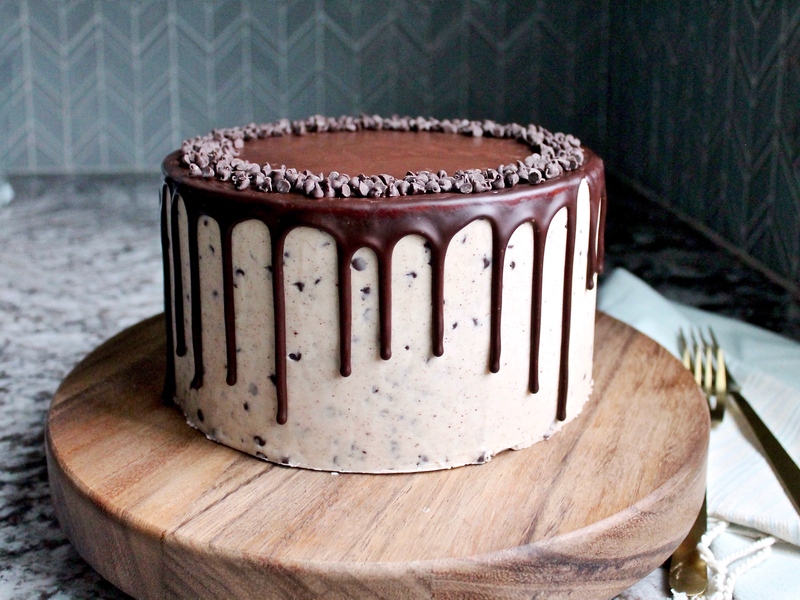 It’s a perfect addition to the cake and almost tastes like actual cookie dough. Win, win. Since Westin was part of the reason I made this cake, I wanted him to join in on the decorating. So, with my second batch of the cake, I made two small cakes we could work on together. I’m so impressed with how good he’s getting at frosting and smoothing the sides of the cake. Unfortunately, the drip was a little too warm when he added to his cake, so it got a bit messy. But, the overall shape and look of his cake was something to be proud of for sure! I can’t wait to hear your thoughts about this cake. I hope you love it as much as I do! 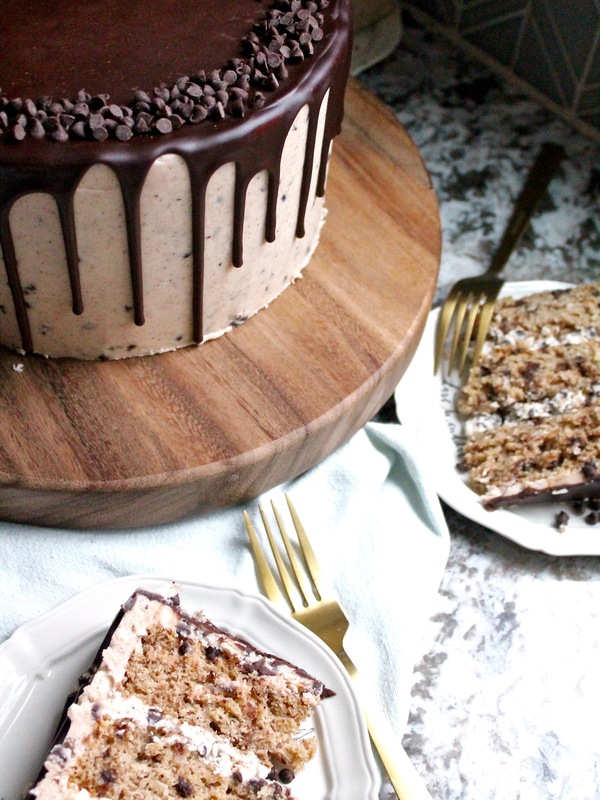 Tender and hearty oatmeal chocolate chip cake layers, covered in a cinnamon chocolate chip buttercream. Preheat your oven to 350 degrees F. Spray three 8-inch round cake pans with nonstick cooking spray, line the bottoms with parchment paper and spray again. Set aside. In a medium sized pot bring the water to a boil. Add in the oats, stir and remove the pot from the heat. Cover the pot and allow the oats to soak for 20 minutes, until all the water is absorbed. Let the oatmeal cool completely before adding it to the cake batter. In a medium sized mixing bowl, combine the baking soda, salt, cinnamon, flour and Kodiak mix (if using). Whisk together. Set aside. In the bowl of a stand mixer fitted with the paddle attachment, beat the butter and sugars together on medium speed for 2 minutes until light and fluffy. Add in the vanilla and the eggs and mix until combined, scraping the sides of the bowl as necessary. Turn the mixer to low and add in the cooled cooked oats and the flour, mixing until just combined. (If you're not using the Kodiak mix, this is when you can add in the extra cinnamon and uncooked oats). Toss the mini chocolate chips in a tablespoon of flour and then stir into the batter. 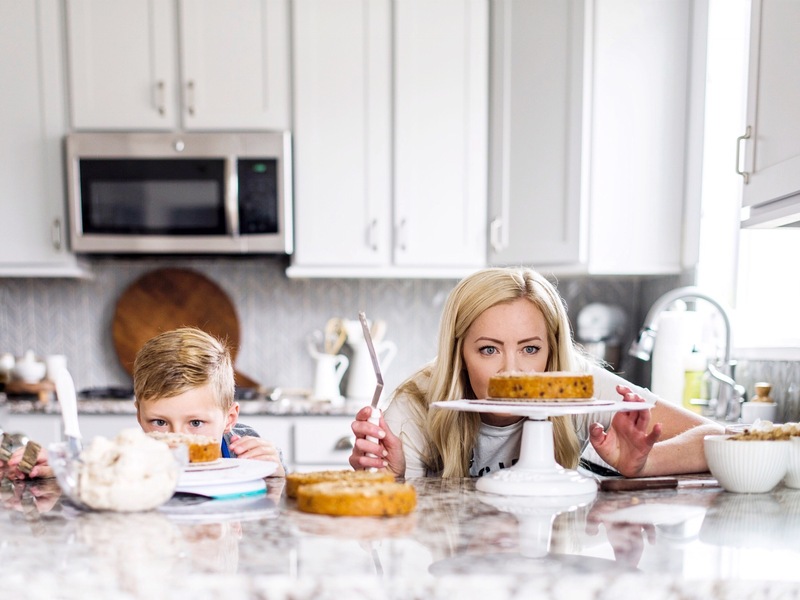 Spread the cake batter into the prepared pans, about 20 ounces of batter in each pan, and bake for 20-22 minutes or until the cake is set in the center and a toothpick comes out with just a few moist crumbs on it. Allow the cake to cool in the pans for about 5 minutes and then invert onto wire racks to cool completely. Level the cakes. If you're not using the cake layers right away, wrap each layer in plastic wrap. You can freeze them up to a week or up to a month if you also wrap them in foil. In the bowl of a stand mixer fitted with the paddle attachment, beat the butter until light and fluffy, about two minutes. With the mixer on low speed, gradually add the powdered sugar, followed by the cinnamon, vanilla and heavy whipping cream. Turn the mixer to medium-high and beat the frosting for about 5 minutes. This will lighten the texture and color a bit. Stir in 1 cup of mini chocolate chips, if using for all of the frosting. If you're only using the mini chocolate chips in between the cake layers, remove two cups of frosting from the bowl and mix in 1/2 cup mini chocolate chips to the two cups of frosting. Heat the heavy whipping cream and pour over the chocolate chips. Let the cream warm up the chocolate chips for about 5 minutes and then stir until smooth and silky. On a cake board, spread a small dollop of frosting to hold the cake in place. Place your first of the three cake layers on the board, crumb side up. Spread 1 cup of frosting (with chocolate chips) on the cake layer. 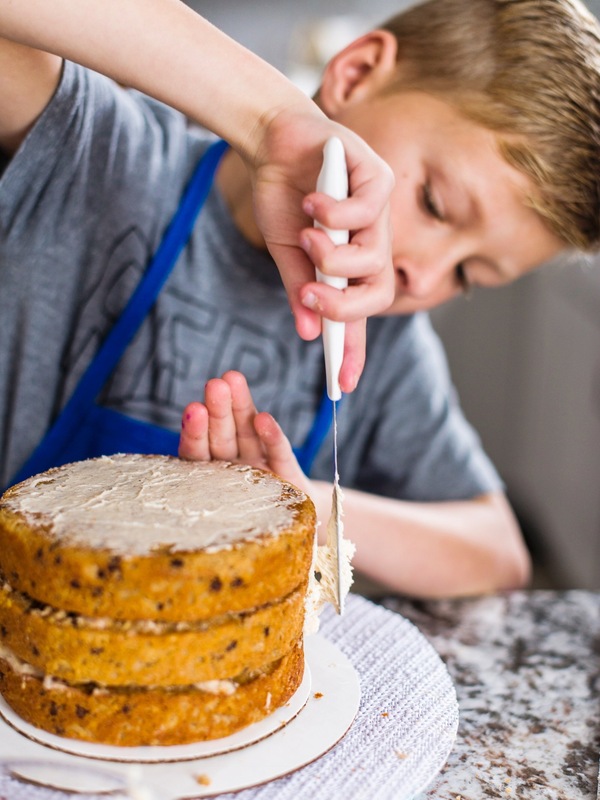 Get eye level with the cake to make sure the layer of frosting is applied evenly. Repeat step 2 for the next cake layer and layer of frosting. For the final cake layer, place it top side down, so the smoothest side of the cake (the bottom) is facing up. Cover the entire cake with a thin layer of frosting. Chill the cake for 10 minutes to set the crumb coat and lock in the crumbs. 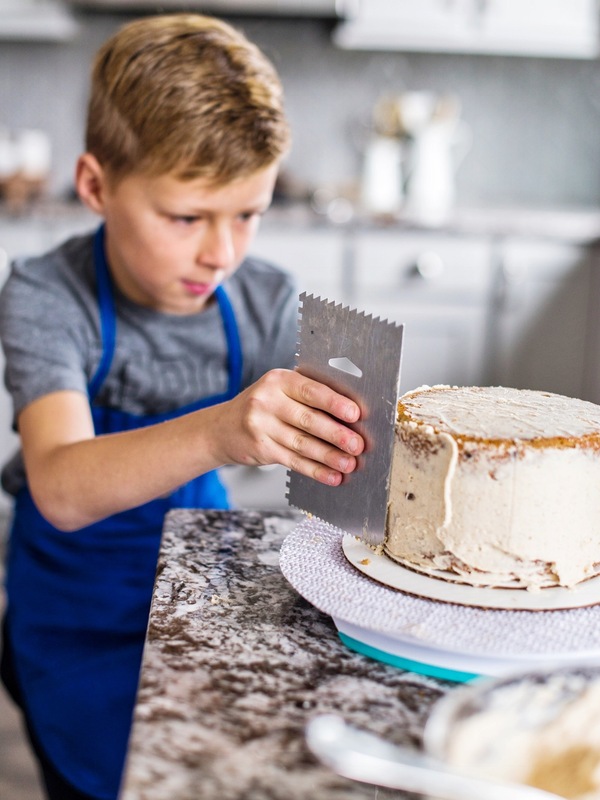 Once the crumb coat is set, frost the cake with the remaining frosting. As mentioned above, you can make this cake without the Kodiak Cinnamon Oat mix - just replace the Kodiak mix with the same amount of all-purpose flour. You'll also want to add another teaspoon of cinnamon and 1/4 uncooked oats. This recipe for frosting makes a little more than what I usually give you. I noticed that my normal amount of frosting didn't quite give me enough to cover the entire cake since I added chocolate chips to it. The chocolate chips make the frosting a little thicker and to cover the entire cake and fill it, you'll need three cups of butter and eight cups of powdered sugar. However, if you don't want chocolate chips in your outter coat of frosting, reduce the butter to two cups, powdered sugar to six cups. The rest of the ingredients can stay the same. If you don't use chocolate chips in the outter coat of frosting, you'll only need 1/2 cups mini chocolate chips to add to two cups of frosting for the filling. Can I use quick oats instead of rolled? This cake looks delicious! Love the chocolate drip! I hope you love it! You’ll have to let me know what you think! Is the frosting recipe really supposed to have 3 cups butter (1-1/2 lbs) or 3 cubes of butter? It is actually 3 cups of butter. I added extra frosting to this recipe compared to my other ones because you need a little more to frost the entire cake if you have the chocolate chips in the frosting like I did. It also gives you a little extra to pipe with if you want to do that too. For the cake, should the butter be at room temperature? Can’t wait to try out this cake! Yes, room temperature for the cake. Since I might make this for my two year old’s birthday, I won’t want a huge cake. For your sons cake pictured above did you halve the recipe or even more? You could half it, but I just used it to make two small cakes for us to decorate together. It will make either three 8-inch layers or four 6-inch layers. Hi Courtney! I have been trying to figure out where to get the cinnamon oat flavor of kodiak cakes mix, any ideas for me? It’s ok if you can’t find it. Look at the notes in my instructions and you can see how to make it without the mix. 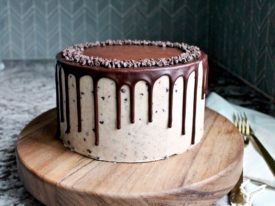 How could I convert this recipe to make a 3 layer 6 inch cake? Your recipes look so amazing, I want to make them all. Please and thank you in advance. If you don’t have the pancake mix, do you add the extra oats in the water at the beginning or add them uncooked at the end? Just add them uncooked at the end. Does the cake have a strong cinnamon flavor? I don’t think it’s too strong.